You’ve probably heard the Johnny Cash classic written about Ireland ‒ Forty Shades of Green. But have you ever tried thirty days of green? Well, that is what’s on the agenda with possibly the longest celebration of Irish culture the world has to offer. And the kicker is, it’s not in Ireland, not even in Europe. We’re talking here about the Hong Kong and Macau Irish Festival. For the entire month of March, which includes St Patrick’s Day on the 17th, this Asian festival runs events and activities that celebrate the Emerald Isle. Such a vast festival is no small undertaking, and it’s made a success by an enormous team effort from the Irish consulate and, the two Irish Chambers of Commerce, Hong Kong GAA club, Alumni from Dublin universities, and the Ireland Fund of China, amongst many others. 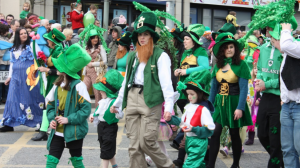 The festival’s calendar is divided into three themes; community, commerce, and culture, providing art, music, food, sport with the highlight being a huge St Patrick’s Day parade to rival those in any city back home. Over the month-long celebration locals of Hong Kong and Macau are invited to have a taste of Irish culture. Sometimes literally, like at the St Patrick’s Day gala dinner, where the ticket price gets diners a six-course meal of traditional Irish grub accompanied by craft beers and spirits. As if all that was not enough, the attendees will be entertained by traditional Irish musicians and dancers. An integral part of Irish society is the Gaelic Athletic Association, the GAA, an amateur sporting body for Gaelic football, hurling, camogie, and handball. As the largest amateur sports organisation in the world, the GAA has spread its reach to wherever there are people willing to play, and Hong Kong is no exception, boasting a Gaelic Football side to be reckoned with. During the festival, the club will play demonstration and competitive matches to share this exciting, tough, physical game with the world. Events under the commerce banner seek to strengthen trade ties between Ireland and Hong Kong and Macau. The food fair showcases some of the naturally tasty and healthy foods produced by Ireland’s agricultural sector, and there are even workshops to impart the skills behind the Old Country’s food, and, of course, drink. Culturally, there’s a lot Ireland can be proud of, and it’s all represented here. The Irish dance schools demonstrate their fleet feet, and there are readings from Irish authors to be enjoyed. The 2016 festival was a historic one, being the centenary observance of the 1916 Easter Rising; the occasion was marked by talks and documentaries on the significant event in Ireland’s struggle for independence. 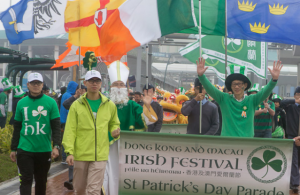 The pinnacle of St Patrick’s Day celebrations in Ireland is the March 17th parade, and in Hong Kong and Macau things are no different. The year 2016 saw parades in both locations with the Hong Kong parade getting underway from Tamar Park. Revelers were joined by over thirty groups from across Asia and from Ireland to march the route accompanied by song, dance, and good old-fashion craic!